Sorry, this is a members-only event. I will be running classes on leatherwork and selling shoes. We are hoping for later opening hours for Saturday, but not yet confirmed. My stall is an Anglo-Saxon tent. It will be near the main entrance to the left. This course is aimed at hobbyists and is NOT designed to enable you to set up in business. I cannot transmit a lifetime's worth of experience and research in a mere 4 days. 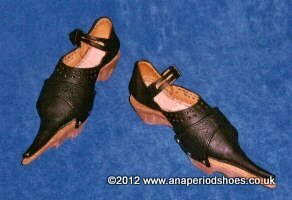 Ana provides historic shoes, boots and wooden pattens for museums, films, theatres and re-enactors. All footwear is hand-made by Ana herself. I only use personally selected leathers and Welsh timber for my shoes, boots and wooden pattens. 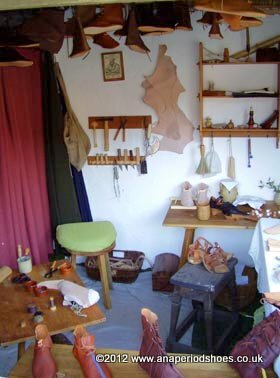 Ana's shoes are available to buy, or you can book me as a historic craft demonstrator and watch me at work in my mobile medieval workshop. I take authenticity very seriously and my products look 100% like the Real Thing. The fully hand-stitched shoes are virtually indistinguishable from the historical originals. But I also offer a few selected styles in machine-stitched budget versions. All stitching on the budget shoes is hidden inside, and once broken-in they look completely authentic as well. My product range covers some amazingly beautiful prehistoric shoes and a very wide range of dark age shoes and dark age boots. Including Viking shoes, Viking boots, Saxon shoes, Saxon boots, Norman shoes and Norman boots. I also make medieval shoes and medieval boots in many variations. This includes custom-made shoes fit for a king with poulaines or krakows, also known as Schnabelschuhe in Germany, as well as sturdy soldiers boots and skin-tight thigh-boots. Tudor shoes are currently available only in two machine-stitched styles. 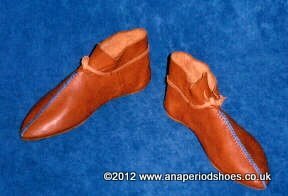 I can also reinforce your reenactment shoes or reenactment boots with additional soles or heels if required. I am fluent in German and can manage written French too.